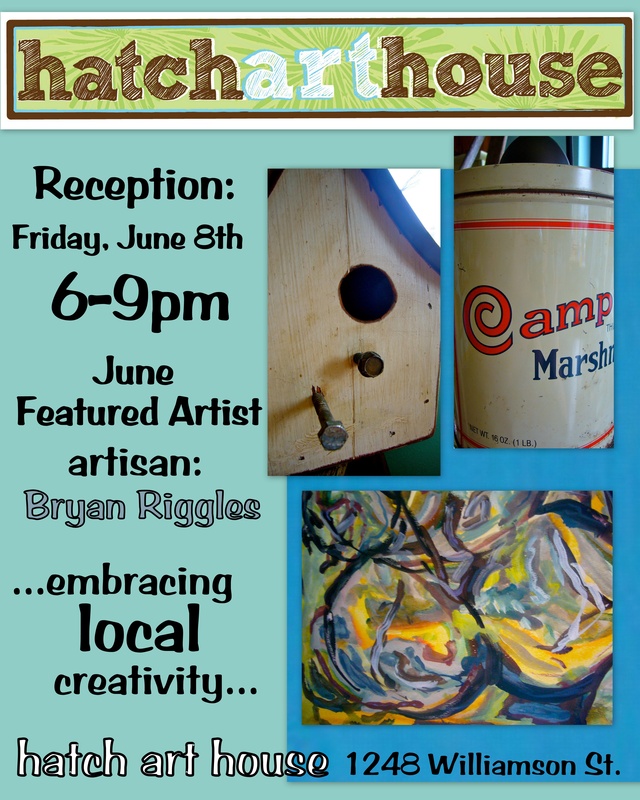 The Hatch Art House June featured artist is Madison’s Bryan Riggles. Bryan is known for making lamps out of vintage household items (such as old tins, Mrs. Buttersworth bottles and cheese graters) and rehabbing/refinishing old wooden furniture (with the express intent of capturing a well-worn and rustic look). His DIY home-improvement and interior design background, enhance his penchant for all things old. He seems to relish the challenge of coming up with creative applications and uses for artifacts that otherwise have little (obvious) purpose in today’s world… thus giving these items a new lease on life. While his favorite medium to create with have traditionally been wood, metal and glass, he has recently been enjoying the prospect of abstract painting. The show runs June 1st-30th with the reception Friday, June 8th, 6-9pm. Good times and refreshments will be served.